Chalkboards are no longer just for classrooms -- they've managed to find their way into homes. These erasable surfaces are multipurpose and highly functional. 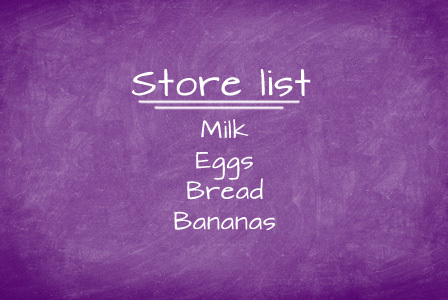 Use them to create a grocery list, document important appointments, or give them to your kids to doodle on. Once you’ve got a board, the only thing missing is the paint! Store-bought chalkboard paint may be affordable, but the color selection is pretty limited. This is a hands-on way to create your own paint in a color of your choosing. Measure out 1 cup of latex paint in the color of your choice. Pour into a container and add 2 tablespoons of grout (this can be purchased at your local hardware store). If you’re not a fan of latex paint, acrylic has been used successfully as well. Tip: If you are experiencing lines in the paint it may be too thick. Try adding a little water to the latex base. Use a paint stirrer to blend the paint and grout. To break up the clumps, be sure to mix it well. 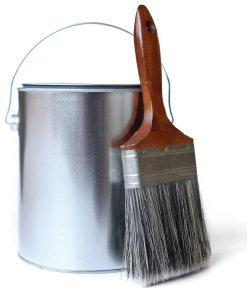 The paint will begin to harden once it’s mixed, and it doesn’t store, so only use what you need. Apply paint with a paintbrush to the object or surface you plan to paint on. Thoroughly coat the surface to ensure complete coverage. Put a minimum of three coats down in different directions. Let dry. After the surface has dried, smooth the layers with 150-grit sandpaper. Lightly rub a piece of chalk over the entire surface in order to slate and condition it. Wipe away the residue with a barely damp sponge, and you're all finished. Your custom-color chalkboard paint is ready for use!